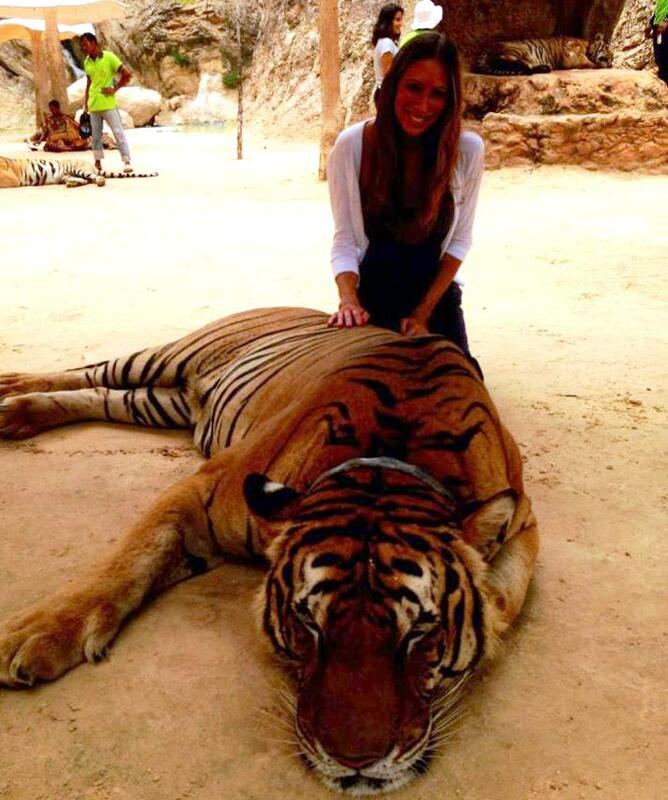 Imagine going to Thailand and being able to not just see tigers, but pet them and take photos with them? I am sure many of you would love to experience this, which is why the Tiger Temple in Bangkok is one of Thailand’s most popular places to visit. Unfortunately, the temple is not all what it seems, as the so called sanctuary is known as being exceptionally cruel to these beautiful creatures. 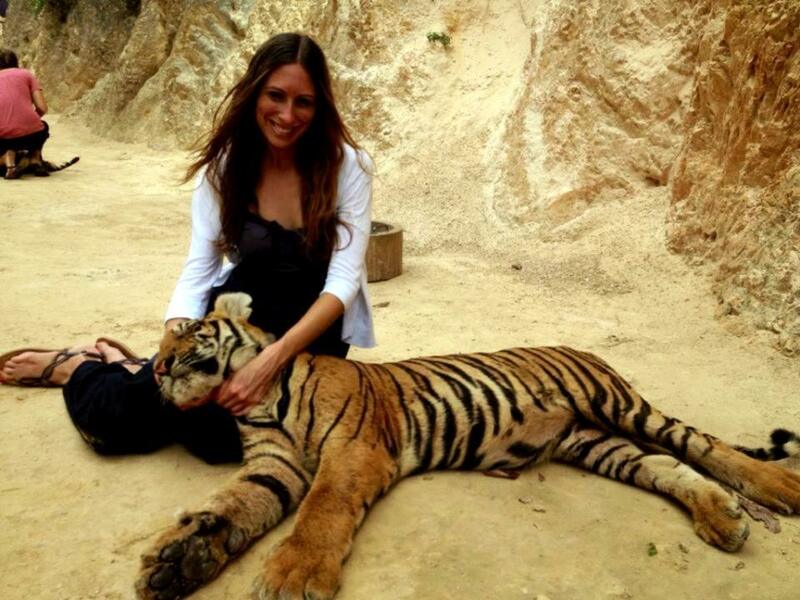 On my trip to Thailand a few years ago I was unbelievably excited to have the chance to visit the temple and have the opportunity to actually sit with tigers. I thought it would be a fun experience and certainly something I would never be able to do in New York! Once I arrived, I walked over to the area where they take pictures of you with the tigers. It was basically a tiger line up. The area had about 10-14 different sized tigers grouped together and chained to the floor. You then go around and take photo after photo with each tiger. The first tiger I sat next to, appeared to smile for the photo and then I noticed he was chained to the floor. And why wasn’t he moving? Is he even breathing? Maybe he is sleepy from laying around in the heat? Hmm, off to the next tiger, same story with this one. Then I moved onto another one, who was completely comatosed. They picked his head up and placed it in my lap. I felt like I was holding a deceased tiger. He was limp as a noodle and just fell into my lap. After that, I realized that something was wrong and I didn’t want to be apart of it. I left the photo area and pulled my tour guide aside to ask him what the real story was behind the place and what I found out was appalling. 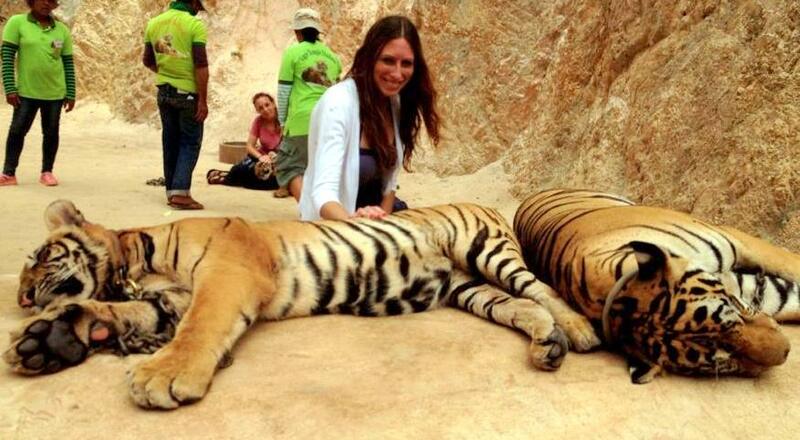 The tigers are indeed drugged, malnourished and treated poorly. They are left outside in the sun all day without shade while countless tourists take photos with them, so that the people who run the temple can make a profit. When they are not laying outside for photo-ops, they are confined in a small cage. This is supposed to be a wildlife sanctuary! The profits are also supposed to go to help save the animals, but it turns out that this is also a lie. It is simply a profit making exercise and to make money for other projects such as opening a Tiger Island to expand the business. Once I got home, I did some research and found out that there is a lot of controversy surrounding them for these issues, along with others such as illegal trade and breeding. As I was waiting around for my tour group, they started to do an exercise program with the tigers. The workers let the tigers out into an area where visitors can watch them “exercise”. Their version of exercising is by taunting the tigers by hitting them with a prop such as a ball tied to the end of a long stick to get them to jump around. At times they were just poking them with sticks to move around and as if it could’t get any worse, you could pay an extra fee, so that you could be apart of it by also taunting them with sticks. So this is where I start to beg, please DO NOT visit this tiger dungeon!! I feel sick to my stomach that I gave my money to this place and took photos, until I realized the horror that what was occurring before me. I wasn’t the only person on my tour that was upset by this experience. Many people complained, so the guide told us about an alternative option, Tiger Kingdom. This establishment treats them properly and the profits actually go to helping tigers. I was skeptical but after visiting, I immediately noticed healthy, awake, tigers roaming around. Don’t believe me? Click the HERE to read about my experience. I’m planning to go to Thailand this year and you can be sure I won’t be putting my feet on this place. Will look into Tiger Kingdom instead! Thank you for raising this, it should be viral!